Of Ice & Engines - Midwest Sports Publishing Network, Inc. The birthplace of big time snowmobile racing and at the core of 25 years of progress and change in the sport, the Eagle River World Championship Snowmobile Derby personifies the thrills and excitement of speed on ice and Of Ice & Engines is the spellbinding history of that famous track in words and pictures by C.J. Ramstad and Dan Satran. 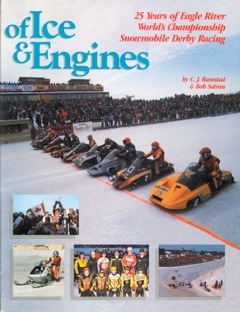 A classic snowmobile tale completely illustrated with over 300 color and black & white photographs, Of Ice & Engines details the racing, the machines and the storied drivers of oval track racing from the days of 8-horsepower putt-putts to the roaring 100+ MPH twin-tracked specials on the slick, banked ice oval. A story of triumph and excitement, this detailed and profusely illustrated book is a must-have for every snowmobiler and every racing fan.